Thank you for visiting RADORA. The English version of our website is currently under construction. If you have any questions please don't hesitate to contact us. 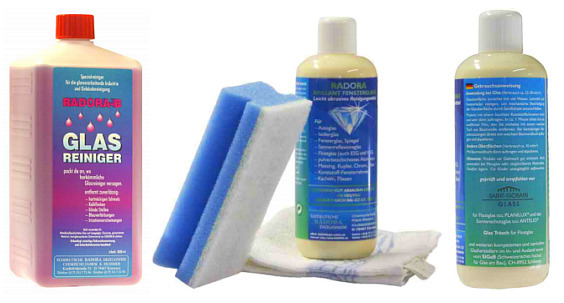 RADORA BRILLANT Window Shine and RADORA-B Glass Cleaner – Are two products that have been proven in decades from our house, to be ideal for cleaning windows in new buildings and regular cleaning of large glass facades as well as for the perfect cleaning of auto glass. RADORA BRILLANT is a soft abrasive cleaner for car windows, insulated glass, windows, mirrors, UV-reflection glass, float glass, aluminium-coated with powder, brass, copper, chrome, silver, window frames made of synthetic material, glazed tiles and tiles. It is reliable in Eliminating: striae, suction prints, silicon-networks, as well as smooth silicon residue on glass. The product is recommended by: SAINT-GOBAIN GLASS, SCHOTT GLAS AG, Pilkington for the Pilkington Activ ™ to eliminate Silicon, GLASS Trösch and other competent and reputable glass manufacturers in Germany and abroad and by SIGaB (Swiss Institute for glass in construction). RADORA B is suitable for cleaning glass which is strongly dirty glass polluted sediments of concrete and finishing coat residues, further erosion of concrete facades, as well as for blind, bluish or satin and sandblasted glass. Many large glass processors, window manufacturers, facade builders and building cleaners recommend our cleaners and use it too.